NETWORK FINALS: AMERICAN IDOL gained 0.1 in final numbers. CABLE HIGHLIGHTS: USA’s WWE telecast was at 0.92/0.91/0.83, compared to last week’s 0.99/0.97/0.96. 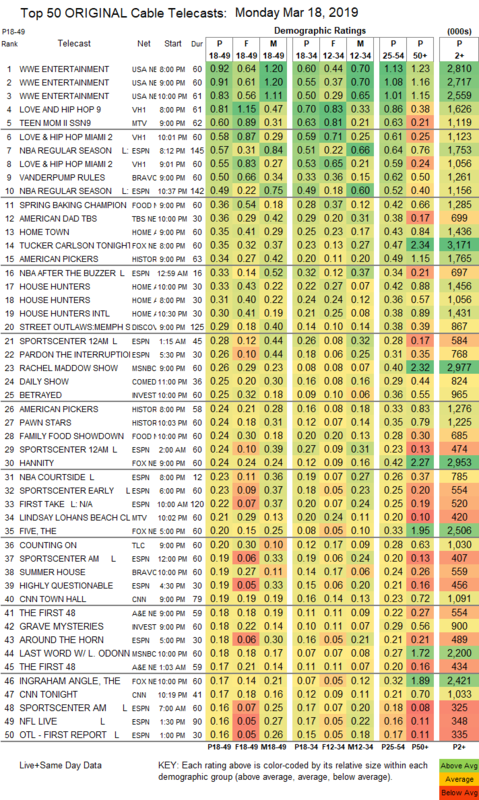 On VH1, LOVE & HIP-HOP was at 0.81/0.58/0.55 compared to last week’s 0.68/0.53. On MTV, TEEN MOM rose 0.05 to 0.60, and LINDSAY LOHAN’S BEACH CLUB was up 0.05 to 0.21. ESPN’s NBA doubleheader was at 0.57/0.49. On Bravo, VANDERPUMP RULES gained 0.05 to 0.50, and SUMMER HOUSE was down 0.02 to 0.19. 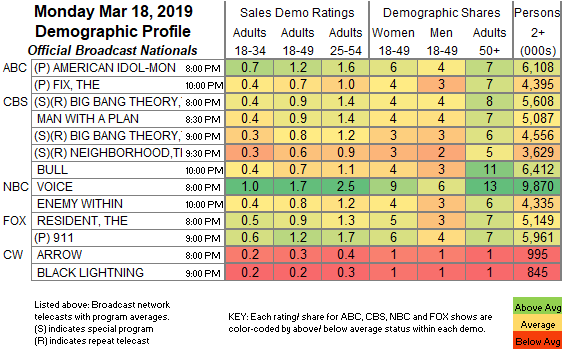 On Food Network, SPRING BAKING CHAMPIONSHIP returned at 0.36, and FAMILY FOOD SHOWDOWN was at 0.24. TBS’s AMERICAN DAD dipped 0.04 to 0.36. On HGTV, HOME TOWN rose 0.08 to 0.35, HOUSE HUNTERS was at 0.33/0.31 compared to last week’s 0.29/0.28, and HOUSE HUNTERS INTL was up 0.02 to 0.30. On Discovery, STREET OUTLAWS dropped 0.07 to 0.29. Fox News’s TUCKER CARLSON TONIGHT led cable news at 0.35/0.47/3.2M, with MSNBC’s RACHEL MADDOW SHOW at 0.26/0.40/3M, and a CNN TOWN HALL at 0.19/0.23/1.1M. On ID, BETRAYED fell 0.11 to 0.25, and GRAVE MYSTERIES was down 0.05 to 0.18. On History, AMERICAN PICKERS and PAWN STARS each ticked down to 0.24/0.24. TLC’s COUNTING ON shed 0.03 to 0.20. A&E’s THE FIRST 48 lowered by 0.03 to 0.18. HBO’s documentary THE INVENTOR: OUT FOR BLOOD IN SILICON VALLEY was at 0.16. Freeform’s SHADOWHUNTERS was steady at 0.12.